History lovers rejoice! Santa Fe is not only an amazing cultural destination, it also has a rich tapestry of history woven throughout its 400 years of existence. Yes, you read that right. At 400 years old, Santa Fe is our Nation’s oldest capital city, and the second oldest city overall! Centuries ago, the land was inhabited by Native Americans. One of the earliest known settlements here was a Native American group, called the Pueblo people, who settled the area as a trade and commerce center somewhere between 1050 to 1150. In 1610, Santa Fe became a Spanish colony, and was governed by them for 200 years. Eventually it became a part of Mexico, and then in 1848, the United States. Shortly thereafter, thousands of American pioneers came west on the Santa Fe Trail. These intersecting cultural influences are still evident today, where you can see the fusion of Anglo, Spanish, and Native cultures. Thanks to the rich Santa Fe history, US News ranks Santa Fe #5 as a historic destination. It has also been ranked one of the Dozen Distinctive Destinations by the National Trust for Historic Preservation. These accolades and more provide you with a great reason to come check out Santa Fe history for yourself! 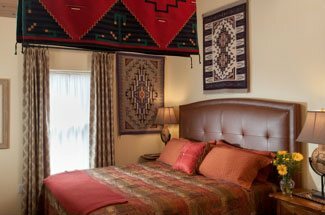 Stay at our luxury Santa Fe bed and breakfast, and let the history lover in you explore the area’s preserved architectural traditions, historic sites, Indian Pueblos, and community celebrations such as the centuries old Fiesta de Santa Fe. Santa Fe is a living link to the past, with well-preserved historical districts and an unparalleled dedication to cultural conservation, which gives Santa Fe the reputation for being one of the most original and authentically-preserved cities ever. Santa Fe is famous for its adobe architecture, which are typically low-slung structures made from mud bricks. This style of architecture was first established by Native Americans, and later Spanish colonists. In modern times, mud bricks have been replaced by plaster, but the red and yellow colors of the sun dried bricks have been preserved throughout the region. 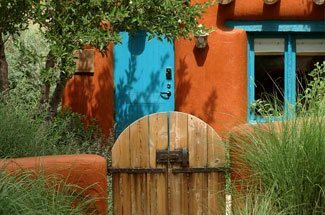 Blue is also a popular color in adobe architecture, especially for window frames. Given the unique nature of architecture around Santa Fe, interior spaces are generally treated very simply, often with historic features such as Pueblo rugs, Spanish colonial furniture, and other indigenous art. Preservation efforts are evident when you stroll around Santa Fe. The Santa Fe Plaza has been the economic, social, and political center of Santa Fe for centuries. Today, you’ll find the plaza surrounded by Pueblo, Spanish, and territorial styles. Included in this beautiful architectural area is the Palace of the Governors, which was built between 1610-1612, and is the oldest public building in the USA. 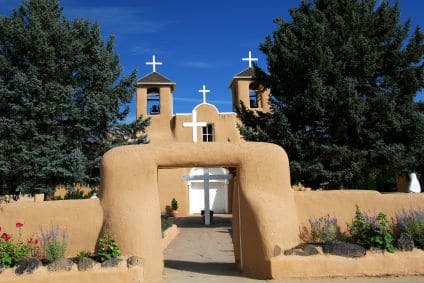 Nearby, you’ll find the San Miguel Mission, built somewhere around 1640 with a blend of Native American and Spanish Colonial architecture styles, and is considered the oldest church in the US. Other Pueblo buildings like those seen here may still be standing, but they were destroyed when the enslaved Pueblo people rose up against the Spanish in 1680. Head on over to Canyon road to take a walk down more Santa Fe history. Canyon road is an old Indian trail that once connected the Rio Grande to the Pecos River. This passageway provided a transportation system for agriculture and trade that was essential to early inhabitants of the region. Today, Canyon road boasts the second largest art market in the United States, specializing in contemporary, traditional, and Native American art, and is still a rich part of Santa Fe’s abundant history. Also worth visiting is the Loretto chapel, which stands at the end of the Old Santa Fe Trail and is home to the “miraculous staircase“; an engineering and architectural masterpiece. If you’re short on time, you can take a 75-minute tour on the Loretto Line, an open-air trolley tram, that gives you a tour of important Santa Fe history. No matter how you choose to explore our historical city, we look forward to your stay at our luxury Santa Fe bed and breakfast.